Given the geography of the Low Countries, it is surprising that musicians there have such a natural affinity with Strauss' Alpine Symphony. 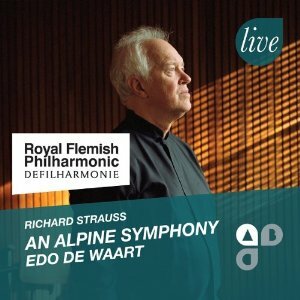 This release on the Royal Flemish Philharmonic own label comes just a few years after a very similar release from the Concertgebouw on their own label. The work is, of course, a fabulous orchestral show-piece, so it is no surprise that these orchestras are using it to show off their skills, and in fact the LSO has also recorded the work for their own label in recent years. The comparison between this reading and that from the Concertgebouw under Jansons is very interesting. Jansons opts througout for broad, expansive textures. Edo de Waart takes a different approach. He certainly makes the most of the climaxes, but he also injects momentum and drive into the quieter passages. This recording is only a few minutes shorter than Jansons', but de Waart is able to make it seem faster than it actually is. Some atmosphere is lost in the process, but the payoff is a much more coherent, more symphonic Alpine Symphony. Given the vast array of high quality recordings on the market (Karajan's 1981 version usually tops the list), it is just as well that there is something distinctive about this reading. I'll concede that I prefer a more expansive approach, but this one might just be for you if you think Strauss needs saving from his own excesses. The orchestra are on fine form, and the woodwind and brass solos restore some the epic quality that escapes de Waart. The balance is good, especially at the summit and in the storm, where the brass and percussion can so easily overwhelm. There are one of two slightly ragged entries where the front and back of the (admittedly huge) orchestra fail to synchronise, but from a technical point of view that is the only discernible problem. The recording quality is excellent, and bares comparison with the SACD audio on the Concertgebouw version. And even without that extra bit-depth, the clarity and presence of the orchestral sound is close to ideal. The bass in the mix is just right, with enough power to rumble the floor if you turn it up, but retaining a sense of natural balance across the range. The serial number suggests that this is the first release on the RFP Live label, and if so they are off to a great start. The informative liner give some interesting insights into the influence of Nietzsche on the work. As you'd expect from an own-label release, there is a full orchestra list. There are track listings, but unusually no timings. Perhaps this is to hide the disappointingly short runtime of just 52 minutes. There's space for another half hour of music here, and any of Strauss' shorter tone poems would have been a welcome filler.